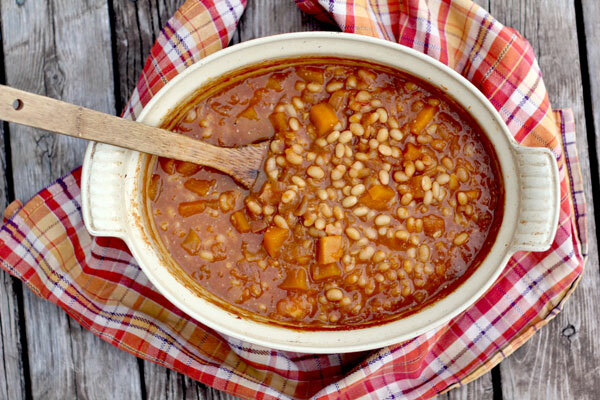 These baked beans combine chopped pumpkin, pumpkin puree, apple cider, and chopped apples to create a sweet and tasty comfort food, perfect for a chilly fall day. 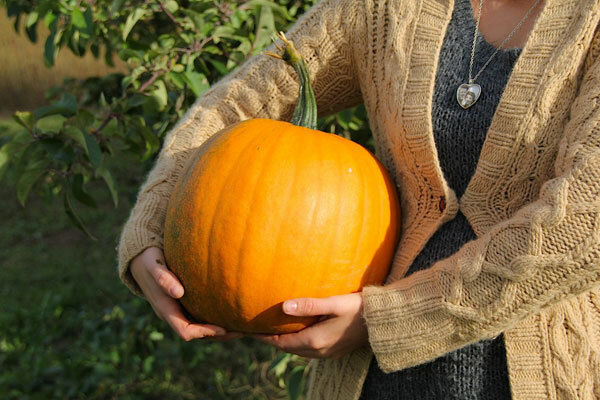 This recipe is also a great way to use up any pumpkin flesh left-over from when you carved your Halloween pumpkins. Dry beans are much cheaper to use than canned beans and you’ll avoid the harmful BPA chemical that lines the coating of metal cans. They’re very easy to prepare and simply require starting this recipe the day before. For this recipe, I recommend a good white bean such as navy beans or great northern beans. You can also opt to use hard apple cider instead of sweet apple cider, in which case you may want to add a couple extra tablespoons of molasses or honey. 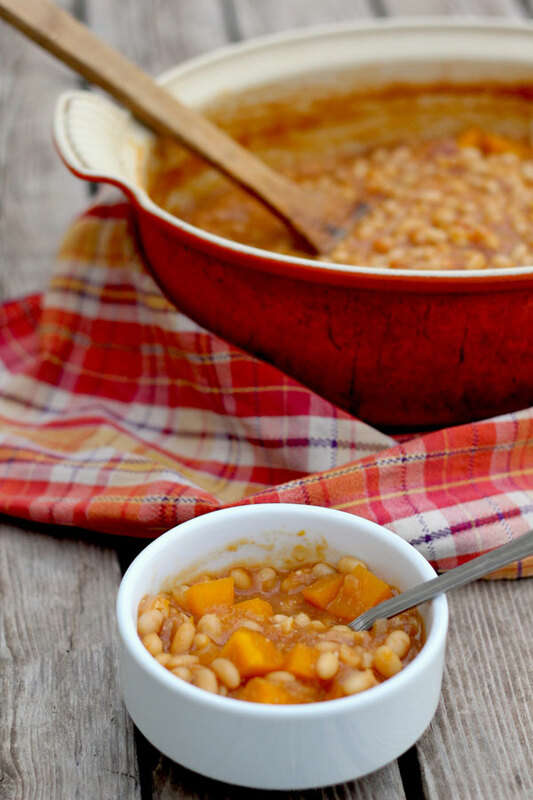 On a chilly, Fall day, these baked beans combine pumpkin and apple for a hearty side dish from Aube Giroux of the Kitchen Vignettes blog. Soak the dry beans for 12 hours, making sure there is at least 3 inches of water above the beans. Drain the beans and place them in a saucepan filled with enough water to cover 2 inches above the beans. Simmer the beans on medium-low heat for 1 to 2 hours, until tender and fully cooked. Drain the beans but reserve 1 cup of the cooking liquid. In a large dutch oven or heavy-bottomed pot, sautée the onions in the olive oil until soft and translucent. Turn the heat to low and add the tomato paste, molasses, honey, dijon mustard, minced garlic, and pumpkin purée. Cook for a few minutes, stirring well until smooth. Whisk in the apple cider and add the beans and reserved cup of cooking liquid. Mix well. To cook the beans, you can either simmer them on your stovetop on low heat or bake them in the oven at 300F. Cook them for one hour, and then add the chopped pumpkin, chopped apple, and the butter. Cook them for another 1 to 2 hours, or until the beans have reached the desired consistency. If you prefer your baked beans to be very thick, you can remove the lid for the final hour of cooking so that more liquid evaporates (in which case give them a stir every now and again to make sure they don't burn at the bottom). In the last hour, you can add the salt and pepper and make any flavor adjustments needed. For instance, I sometimes add an extra tablespoon of molasses if I find they aren't as sweet as I would like. Serve warm.